Retinoblastoma can extend outward through different structures of the eye. It may disseminate through the optic nerve into the CNS and through the sclera to the orbit. Retinoblastoma can also give rise to systemic metastasis after gaining access to the choroidal circulation or after locoregional dissemination to the orbit and lymph nodes. 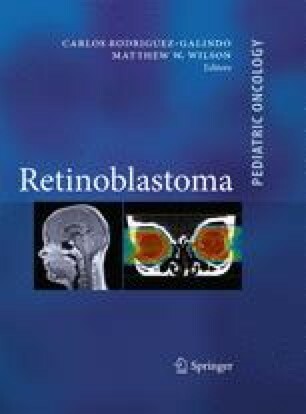 Usual metastatic sites of retinoblastoma include the CNS, bone and the bone marrow (MacKay et al. 1984). Less frequently, retinoblastoma can metastasize to other organs, such as the liver or distant lymph nodes. The presenting signs and symptoms of metastatic retinoblastoma are quite variable and depend on the site or sites of involvement. In patients who have previously undergone enucleation, orbital recurrences often present with the parental observation that the prosthesis is no longer fitting well. More extensive orbital disease may present as a visible mass. Central nervous system disease can occur as optic nerve disease tracking posteriorly into the brain, or as diffuse leptomeningeal involvement. Again, signs and symptoms are variable, depending on the locations involved and the degree of involvement, but may include headache, irritability, emesis and/or focal neurological signs. Bone disease may present with pain, and bone marrow disease may present with abnormally low blood counts, but often, disease at those sites and liver disease may be asymptomatic and discovered only during evaluation of the extent of the disease(Table 8.1).